This past week I have been finishing off those new ravens and slotting them in to the pencil outlines already completed. 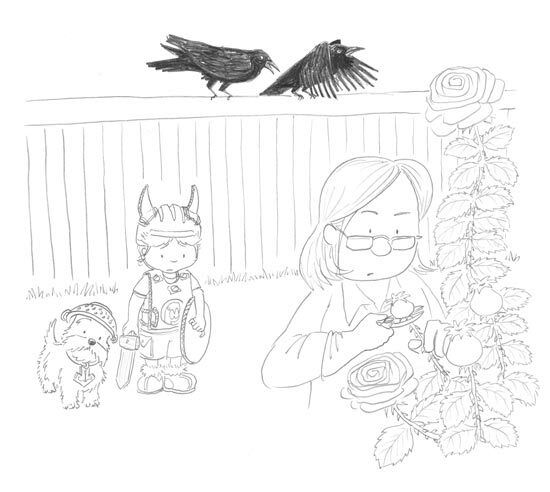 Categories: final artwork | Tags: progress report, ravens, sketches | Permalink. No, not ‘rapping’- rapping, as in ‘tapping’. As in the famous poem… anyway. I’ll get on with it shall I. My point is, the ravens are in the back of my mind a lot these days. I recently finished all the pencil lines for the book. Hurrah! The next step is all the colouring. But before I move on to that, I looked back on the pencils, checking for little issues. 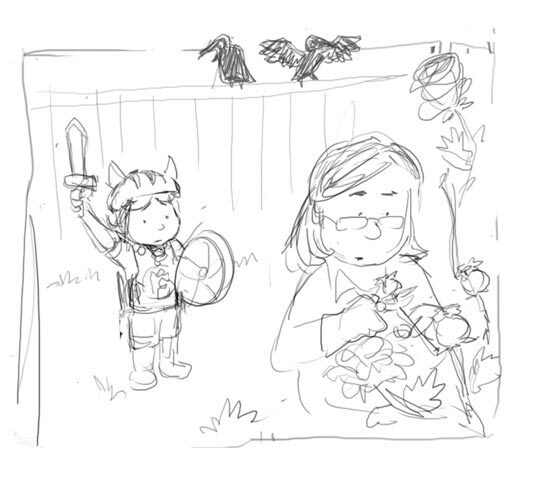 And I found inconsistencies in the ravens I’d been drawing. To start with, I’d only looked at a few reference photos, then made it up as I went along. ‘That looks about right,” I’d think to myself. But the ravens didn’t look quite right at all. They looked a little too fluffy and friendly- more like dirty pigeons. When I drew the last few ravens in the book, I worked from reference photos, and the difference was huge. So I’m going back page by page and redrawing the earlier ravens, using the most excellent reference photos known to man. Where did I find these most excellent reference photos, I hear you ask? Why, on the website of Paul Lantz, a photographer in Canada. He happens to have a passion for ravens, and has collected dozens of high-resolution photos of them in all sorts of poses and situations. It’s absolutely brilliant. Here’s the gallery. My favourite series of photos shows a raven being accosted by three crows. There’s one photo where it looks like the raven is exploding. Using these references, I’ve been able to go back and make the ravens look more realistic. Here’s my more recent sketches – still roughs at this stage. I’ve been looking at ravens more closely than I ever have before in my life, and it’s made me appreciate them more. Sure they’re a bit creepy. Sure their beady eyes seem to stare into your soul and say, ‘if I could eat your soul, I would.’ But hey, the way that light shines on their black feathers and goes all purply- that’s really beautiful. And the way their feathers stretch out mid flight like razors- just awesome. Ravens rock. Categories: Character development | Tags: ravens | Permalink. As I’m currently busy with final artwork, I thought I’d take a different tack for this week’s post- rather than focus on a specific character and their development, I’d show you some more recent sketches and sculptures. I’ve been looking more closely at ravens lately- though I wish I’d done it sooner. 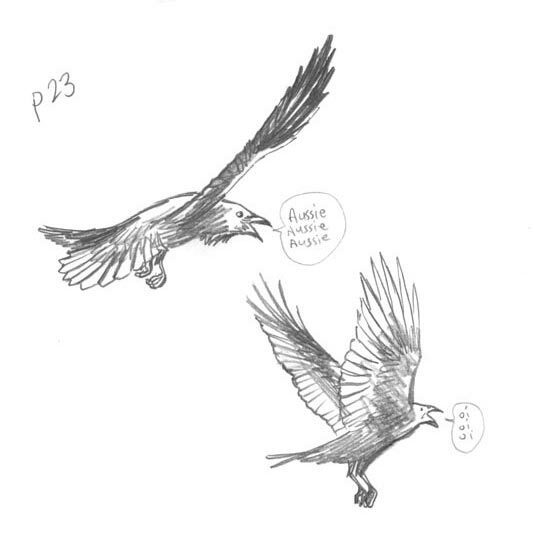 I’ve almost finished all the pencil outlines for the book, and I’ve realised that the ravens in the first three-quarters of the book look like dirty pigeons. The ones I’ve drawn more recently are looking much more accurate, because I’ve been looking at reference photos. Who would have thought that drawing from life was the way to go. 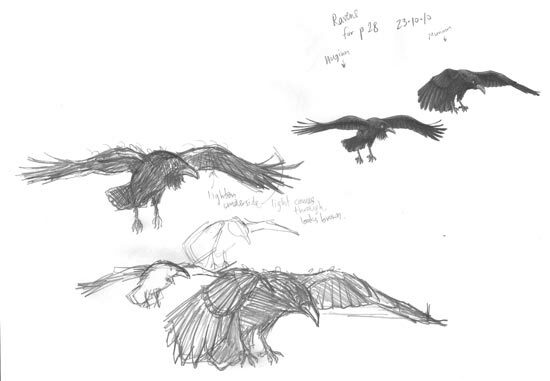 Here’s some studies and some final artwork for the ravens on page 28… (when pages have been tricky, I’ve sometimes been drawing the backgrounds and characters separately, then stitching them together with photoshop). I’ve discovered that ravens have very complicated bodies, and their bodies look different all the time- they can hunch their back, pull their shoulders up, bob their head up and down- and then of course you have all the different movements involved in flying (and then, how to show those movements from different angles). Without reference photos I’d be stuffed. Here’s another raven drawing- this guy goes on page 25. 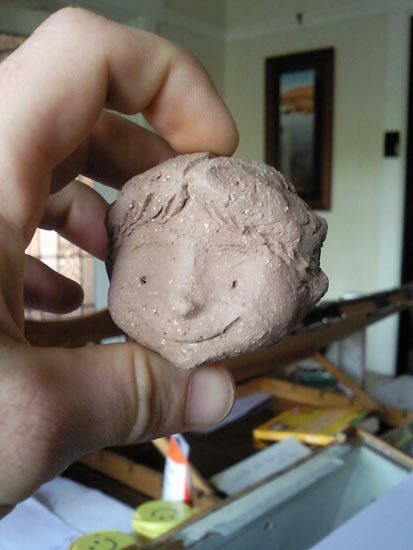 I’ve made another Josh sculpture too- I was having trouble getting his profile right, so I put this guy together. He’s more accurate than the previous sculptures I’ve done. At one point I was feeling very stuck- I didn’t know if what I was doing was good enough, and I was fussing over unimportant details. 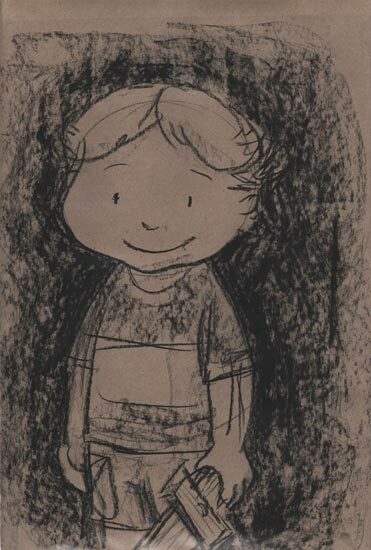 One of my illustrator buddies, Karen Blair, suggested I pull the stick out and draw with some charcoal. Here’s the result- it’s just over A3 size. After doing this sketch, things got a lot easier and much more fun. Cheers Karen. Charcoal helps me loosen up my drawing. 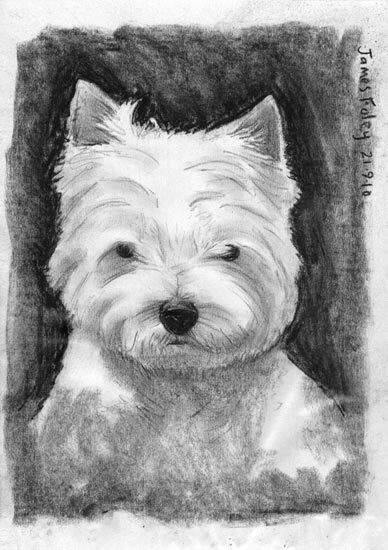 Here’s a more realistic Westy sketch I did recently in charcoal. 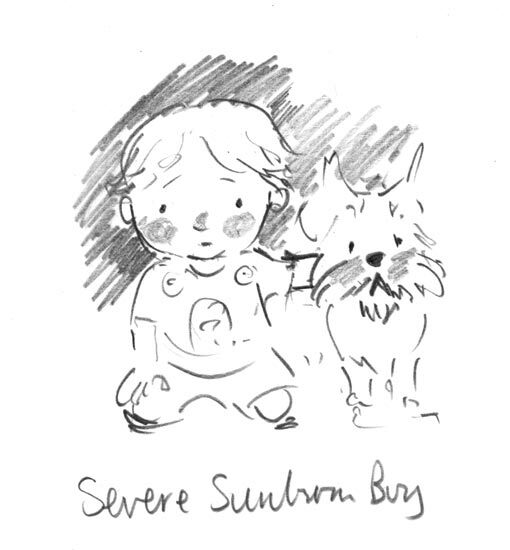 And finally, as a super special treat, here’s another sketch- but it’s not by me, it’s by Karen. It’s her take on Josh and Wolverine. Josh’s rosy cheeks looked a little like he’d spent too much time in the sun, hence the caption. Categories: Character development, final artwork | Tags: 2B pencil, charcoal, clay sculpture, Josh, ravens, West Highland Terrier, Westy, Wolverine | Permalink. I thought people were hard to draw. Turns out ravens are impossible. Okay, I’m being melodramatic. They’re not impossible- just difficult. I’ve never made a habit of drawing birds before, so I’ve had to start practicing. I’m paying attention now. In the last year whenever I’ve seen crows or ravens about, I’ve stopped doing whatever it is I’m doing and I’ve stared. I’ve chased crows around the park with my mobile phone, trying to take videos and pictures. I’ve sat on the grass with my sketchbook and tried to draw them as they hop around, then inevitably fly off, their opinionated squawking trailing into the distance. And my drawings have gotten better (mostly). Ravens are incredibly intelligent birds, capable of logic and problem solving- I had no idea how intelligent until I started researching on youtube. There are two ravens in Norse mythology- their names are Huginn and Muninn, which mean Thought and Memory. They belong to Odin; every day they fly around the world (the land of humans known as ‘Midgard’) and note the events taking place. Then they fly back to Odin to report. 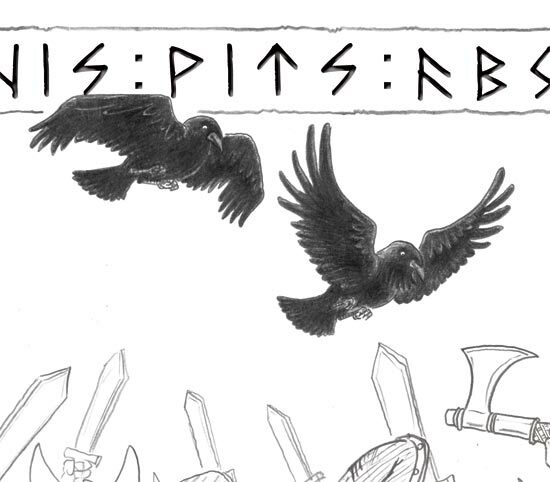 So in our story, the ravens provide a vital link between Josh’s world and the world of the Viking Gods. When the ravens turn up, the Gods aren’t far away. 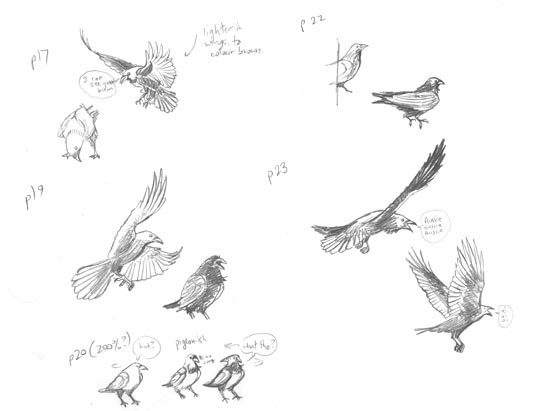 My first sketches in the storyboards were merely placeholders- rough ideas of where the ravens would go, once I knew how to draw them. …and I’ve learnt to draw some better looking birds. You’ve probably heard that a group of crows is called a ‘murder’. The same name is used for a group of ravens, but there are some other suggestions floating about too : a conspiracy, an unkindness, a storytelling, a congress and a parliament are also used. (Or at least, that’s what a quick google search told me). 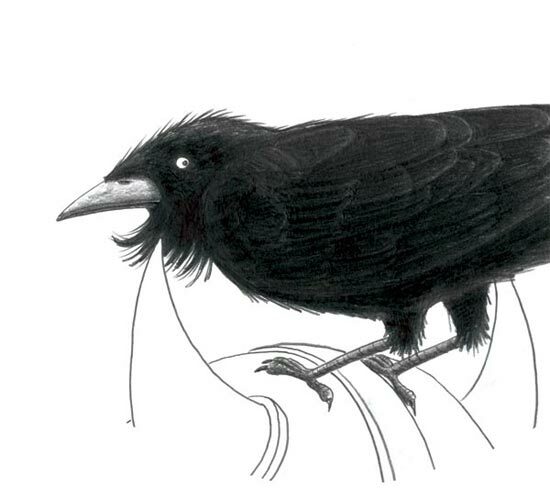 Ravens were used as symbols in Viking times, and can be found on flags, in the Bayeux Tapestry, and on helmets. There is an Australian species of raven, found in WA (around Perth and on Rottnest Island), and in much of the eastern states. There isn’t much difference between a crow and a raven. They belong to the same family of birds. Ravens are usually bigger. Categories: Character development, Research | Tags: Fremantle Press, James Foley, Norman Jorgensen, ravens, The Last Viking | Permalink.